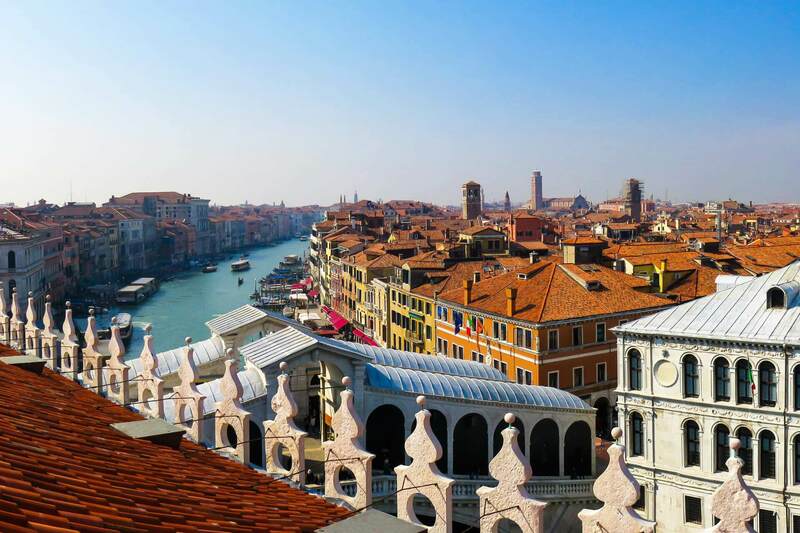 Few 4 star hotels in Venice can boast a strategic location like Hotel A La Commedia, near the Rialto Bridge and a few minutes walk from St. Mark's Square. 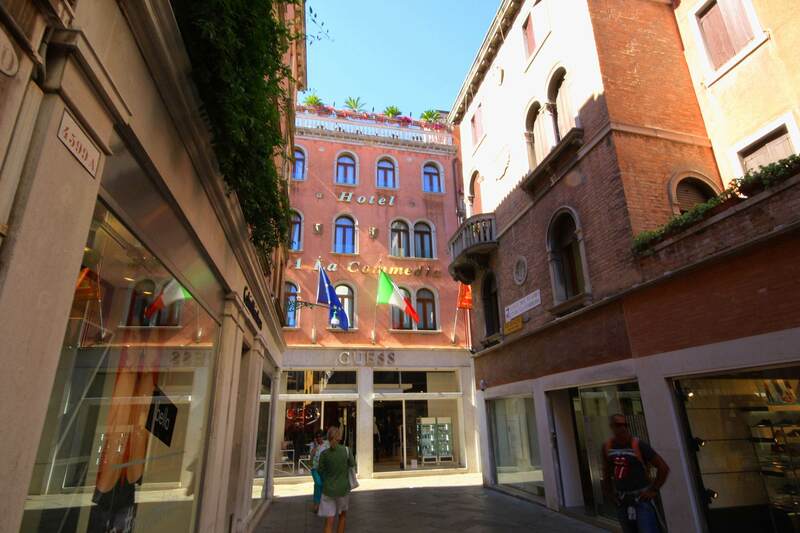 Located just steps from the Goldoni Theater, in a quiet yet central street in the heart of the city, the hotel is ideal for visiting the most famous places in Venice and luxury shopping in the boutiques that characterize the downtown area. From the hotel, without crossing any bridge, you reach the Rialto stop of waterbus n. 1. From here, Venice, the islands and the airport are really at your fingertips! "Perfect location, only a 2 minute walk away from Rialto and 10 minutes away from San Marco which allowed us to enjoy these fabulous and uncrowded areas at dawn, unforgettable" - TripAdvisor traveler, 2016. Hotel A La Commedia is easily accessible from any of Venice's arrival terminals: Marco Polo Airport (VCE) , Treviso Canova Airport (TSF), the cruise terminals (San Basilio, Marittima) , Piazzale Roma Car & Bus terminal and Santa Lucia train station. Via lagoon / water | Once you passed through customs and then through the automatic doors, in the arrival hall follow the light blue signs for "Water transportation". In about 5 minutes, you'll reach the harbour / marina from where you will be able to either board on a private water taxi (yellow band on its sides, officially authorized) that will directly take you, in about 30 minutes, to Rialto - Riva del Carbon, or on one of the big Alilaguna motorboat that will take you in 1 hour, after a few stops, to “Rialto” boat stop / pier. Just off the waterbus stop, follow the instructions "From the waterbus stops". Via ground | Outside the arrival hall of the airport you can either get on the ATVO bus which is a direct service (about 20 minutes ride) or the ACTV line 5 public service bus (AeroBus) which makes intermediate stops (30 minutes ride). Both bus services arrive at "Venice - Piazzale Roma” (last stop), from where you can either catch a private water taxi (yellow band on its sides, officially authorized) that will directly take you, in 10 minutes, directly to Rialto - Riva del Carbon, few steps away from the hotel; or get an ACTV waterbus line 1 or 2 that will take you, in about 15 minutes, to "Rialto" boat stop / pier. Just off the waterbus stop, follow the instructions "From the waterbus stops". Waterbus line 1 takes longer time but stops at the Rialto pier where you do not have any bridge to cross in order to get to the hotel. Waterbus line 2 is quicker but once off at Rialto pier you will have a small bridge to cross in order to reach the hotel entrance. Outside the arrival hall of the airport you can either take the ATVO bus (about 1 hour and 20 minutes ride) to “Venice - Piazzale Roma” or the Barzi Bus Service (via Highway) to the Tronchetto Island or a taxi (30-40 minutes ride) to “Venice - Piazzale Roma”. From there you can either catch a private water taxi (yellow band on its sides, officially authorized) that will directly take you, in 10 minutes, directly to Rialto - Riva del Carbon, few steps away from the hotel; or get an ACTV waterbus line 1 or 2 that will take you, in about 15 minutes, to "Rialto" boat stop / pier. Just off the waterbus stop, follow the instructions "From the waterbus stops". Waterbus line 1 takes longer time but stops at the Rialto pier where you do not have any bridge to cross in order to get to the hotel. Waterbus line 2 is quicker but once off at Rialto pier you will have a small bridge to cross in order to reach the hotel entrance. Please make sure your train arrives to “Venezia - Santa Lucia” railway station and not just up to “Venezia – Mestre” train station, otherwise you will have to take a further train to Venice. Once you arrive and walk outside of “Venezia - Santa Lucia” railway station, just down its steps, on your left hand side, you’ll be able to either get a private water taxi (yellow band on its sides, officially authorized) that will take you in 10 minutes to Rialto, Riva del Carbon, a few steps away from the hotel; or take the nearby ACTV water bus line 1 or 2 (direction Rialto - San Marco), which takes you in about 15 minutes to “Rialto” boat stop / pier. From there you’ll have to continue following the instructions "From the waterbus stops". Waterbus line 1 takes longer time but stops at the Rialto pier where you do not have any bridge to cross in order to get to the hotel. Waterbus line 2 is quicker but once off at Rialto pier you will have a small bridge to cross in order to reach the hotel entrance. From Highways A4 (coming from Padova / Quarto d'Altino / Trieste / Udine) or A27 (coming from Belluno) or State Road "SS 309 Romea” just follow the road signs to Venice. Drive through the whole "Ponte della Libertà” (Bridge of Liberty), flanked by the Venice lagoon on both sides, making sure you respect the speed limit, in consideration of two fixed speed control cameras placed along the bridge, in both directions. You will reach a traffic light where, in case you wish to park at the Tronchetto Island Parking, you need to turn right, otherwise you can drive straight if you prefer parking at Piazzale Roma square in “Autorimessa Comunale” or in “Garage San Marco” parkings. From Piazzale Roma you can either get a private water taxi (yellow band on its sides, officially authorized) that will take you in 10 minutes to Rialto, Riva del Carbon, a few steps away from the hotel; or take the ACTV water bus line 1 or 2 (direction Rialto - San Marco), which takes you in about 15 minutes to “Rialto” boat stop / pier. From there you’ll have to follow the instructions "From the waterbus stops". Waterbus line 1 takes longer time but stops at the Rialto pier where you do not have any bridge to cross in order to get to the hotel. Waterbus line 2 is quicker but once off at Rialto pier you will have a small bridge to cross in order to reach the hotel entrance. In case you parked at the Tronchetto Island, you can also choose whether to take a private water taxi (yellow band on its sides, officially authorized) that will directly take you to Rialto - Riva del Carbon, few steps away from the hotel; or catch the ACTV waterbus line 2 (direction: Piazzale Roma - Rialto), which will take you in about 20 minutes to “Rialto” boat stop / pier, from where you will have to follow the instructions "From the waterbus stops". From the Cruise Terminal (MSC, Costa, Carnival, P&O, Princess, Celebrity, Cunard, Aida, etc) you can take a private water taxi (yellow band on its sides, officially authorized) from the nearby floating dock which will directly take you straight to the hotel (20 mins). 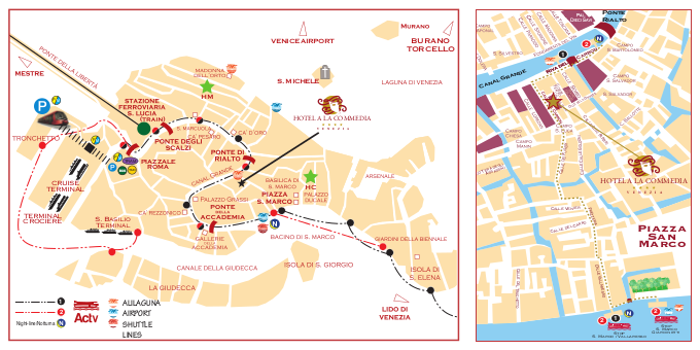 Otherwise, you can walk to the nearby automated monorailtrain station (so called "People Mover"), take it (3 minutes trip), reach Piazzale Roma and from there take the ACTV waterbus line 1 or 2 (direction Rialto - San Marco) and get off at the Rialto stop. From there you’ll have to continue following the instructions "From the waterbus stops". We suggest you to take line 1. From the San Basilio Terminal (Venezialines, Windstar, Yachts Charter, Club Med, Prince of Venice) from the nearby ACTV floating pier, you can either take a comfortable private water taxi (yellow band on its sides, officially authorized) which will directly take you to the hotel or the ACTV waterbus line 2 (direction Piazzale Roma – Rialto), get off at Rialto stop and then follow the instructions "From the waterbus stops". Just off the waterbus stop, turn right and walk along the Grand Canal on Riva del Carbon. 20 metres, walk under the arcade and cross the small bridge. 10 metres ahead on your right there is the waterbus stop of line 1 and Alilaguna Airport link. Just off the waterbus stop, turn right and walk along the Grand Canal. After 50 metres turn left into Calle del Carbon. 20 metres ahead you'll see the Hotel A La Commedia signboard and building.